NextOn my stereo this week: ‘To Live And Die In L.A.’ by Wang Chung. 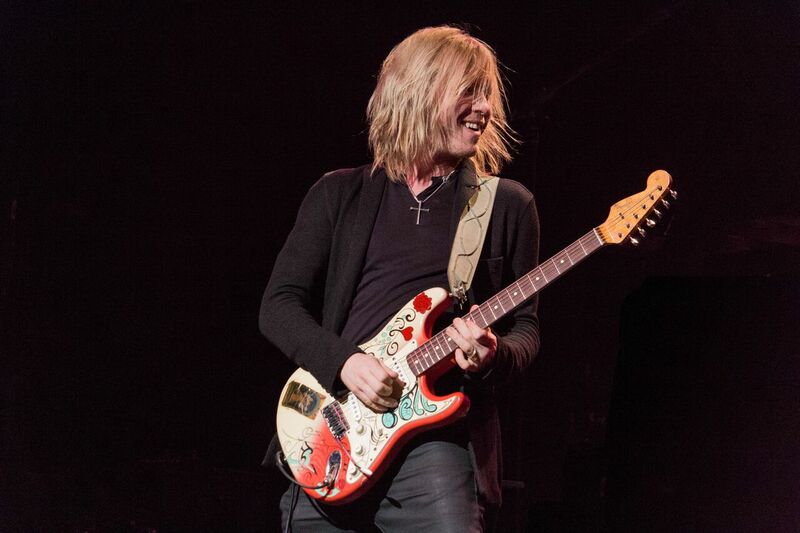 Guitar Heroes: Australian tour interview with Kenny Wayne Shepherd. Only a select few can truly boast a career in blues rock as influential as Kenny Wayne Shepherd. He has a resume that most musicians would die for, having toured relentlessly, releasing a total of eight albums, scoring five Grammy nominations and collaborating with countless of music legends in a career spanning over twenty years. For Shepherd the spark that ignited his insatiable hunger to become a musician occurred way back in 1984, when as a seven-year-old he met Stevie Ray Vaughan. But it would be some ten years later that his breakthrough debut album Ledbetter Heights at the age of 18 would leave fans and critics alike stunned by his talent and experience. Today, Shepherd still thrills music lovers with his blues rock wits and a catalogue of irresistible riffs. Interestingly, last years critically acclaimed album Lay It On Down arguably became the catalyst for the Kenny Wayne Shepherd Band to head back out on tour. Now, for the first time in six years, Shepherd heads down under for what is expected to be an electrifying three show East Coast Tour that commences at Sydney’s Enmore Theatre on October 4, before he travels to Brisbane on October 5 at Eatons Hill Hotel and concludes in Melbourne at the Forum, in which I finally hope to catch the blues legend live for the first time. That said, I was thrilled more recently to catch up with Kenny before he arrives in Sydney next week to commence his tour. Here’s briefly some of what we talked about. Stevie Ray Vaughan is one of your guitar heroes. Can you tell me something surprising about what you admire about him? His passion. The first time I saw him play, I was mesmerized by him. I wanted to be able to make people feel as passionate about music as he was making me feel, and to try and learn to play with the fire, intensity and raw emotion that he did. Besides, Stevie’s influence on you, who else helped shape the guitarist you are today? A lot of people, Jimi Hendrix, B.B. King, Albert King, Billy Gibbons, Eric Clapton, Albert Collins…the list goes on. Why is music so important to you? Why not another art form? I just gravitated to the guitar. I had toy guitars when I was 3 years old and by 7, I had my first electric. I just always loved it. Something about the instrument spoke to me and energized my soul every time I heard it. As a touring musician what are the things you do to continually challenge yourself? Can a musician ever truly master his or her craft? I think you can always keep trying new things to get better. I try never to play songs the exact same way and leave room for improvisation. We also change the set list up to keep everyone on their toes. The inevitable guitar question is next. What are you playing nowadays? What do you love about its sound? Oh you know, I’m playing a variety of guitars. Everything from my vintage Stratocasters to some Custom Shop creations to my signature series guitars. I primarily play Strats but I have some Gibson’s that I enjoy as well. A new 335, a Custom Shop Les Paul and Firebird. Sometimes you gotta branch out to get some different sounds, but the Stratocaster is the guitar that feels most at home in my hands. It’s been some six years since you last toured Australia. What do you remember about your last visit here? What can we expect from the Kenny Wayne Shepherd Band this time around (in October)? I remember every trip I’ve ever had to Australia. I love it there. Our shows will have a little of everything. We try to make sure we play music from all of our records. We will obviously be featuring some of the new album “Lay It On Down” but we try to cover a lot of previous material as well because we’ve had a lot of successful albums that people have been listening to for years and they want to hear some of those songs. You are lucky to have such a great vocalist in Noah Hunt as part of the KWS Band. Will you share vocal duties with Noah Hunt on this tour or will you just let him do his thing? We do share some of the vocal duties these days, but Noah is an amazing vocalist and he sang on most of the songs for the first several records, so he will be handling all of the songs he sings on the records. I’ll be singing some select songs as well because I’m enjoying singing more and more as the years go by. It’s a nice luxury to have Noah though because I can just sit back and play guitar all night if I want to. Your latest album Lay It On Down is a real return to form for you? Are you pleased with the reception it is receiving? I’m really happy with the reception. It’s always rewarding when you put your heart and soul into writing and playing music and the fans love it as much as you do, and the songs have been going over very well in the live show. I read recently how you explained you got out of your comfort zone for this new album. It’s still bluesy but you’ve added a more contemporary feel to it. It’s actually a really rewarding listen. What was the inspiration behind it and its direction? Life is full of inspiration. I just look around and pay attention and find no shortage of things to write about. Finally, who would you have loved to have played with from any era that is no longer with us? And why? Jimi Hendrix for sure. I’ve played with every band member he had, and I even played his white Stratocaster that he played at Woodstock but to play with the man himself would be an amazing treat. Thursday 4 October – Enmore Theatre, Sydney, NSW. Friday 5 October – Eatons Hill Hotel, Brisbane, QLD. Saturday 6 October – Forum, Melbourne, VIC. For more information on Kenny Wayne Shepherd check out his website. You can also follow him via his Facebook page and Twitter feed. Follow him on Instagram. Watch him on You Tube. Photo credit: All images are courtesy of PR group Revolutions per minute. Awesome interview. Am I jealous you got to interview Kenny Wayne Shepherd. Huge score man. He is incredible. His Australian PR team was instrumental in organising the interview. Big thanks to Jade & Nicole at Revolution per minute.